On November 28th in 1942, Boston was the scene of the worst nighclub fire that had ever occured in the United States. The news of the Cocoanut Grove disaster not only stunned Boston, but the rest of the country as well. At the time of the tragedy, World War 2 was dominating the headlines in newspapers. However, almost 500 people died, and many more were injured in this terrible event, so it became the top news story for some time after it occured. The public was outraged once it became apparent that the owner and others were aware of fire hazards and did not do anything about it. This article will discuss the Cocoanut Grove, and what happened in the aftermath. Nightclubs were very popular places following the end of Prohibition in 1933. People had a great time, enjoying live music and dancing, and they could freely drink alcohol. The Cocoanut Grove was half a city block in size, covering about 10,000 square feet. Despite its large size, there were only two main entrances to the club. It was built to be used as a garage and warehouse before it was converted to a nightclub in the late 1920s. The original owners enjoyed success with the Club, but over time they started to lose money. Finally, being deeply in debt, they had no choice but to sell. It was purchased by a man named Solomon, believed by many to be associated with crime in Boston. The Cocoanut Grove thrived, even though alcohol was forbidden at the time. Eventually Solomon was accused of running a multi million dollar bootlegging business, and he was killed. The final owner to take possession of the Grove was Barney Welansky. He had been Solomon's lawyer, and also was believed to have connections to organized crime. The year Welansky took over, Prohibition came to an end. Welansky had big plans for the nightclub. He hired the best interior designer in the Boston area and wanted the place to be completely changed. The Cocoanut Grove added a dance floor, platform stage for entertainment, and a retractable roof, so patrons could enjoy the stars on pleasant nights. It was given a tropical theme, which was very popular, particularly in the cold winter months. The walls and ceilings were adorned with beautiful satin cloth. Lighting was added to the artificial trees. It was thought that the decorations and cloth were fire resistant, but that would turn out to be tragically wrong. Welansky hired underage workers, as he could get away with not paying them much of a salary. One of these employees would be unfairly blamed for the blaze in the aftermath. Once the renovations were complete, the Cocoanut Grove was the most exciting place to be in Boston. It enjoyed great success, and was often filled to over capacity, particularly on weekends. At the time, fire extinguishers and sprinklers were not required. The nightclub was inspected not long before the disaster, with no violations or potential hazards being found. In hindsight, one could say that a disaster at the nightclub was something that was going to happen eventually. Many people smoked in those days, particularly if they were out at a nightclub. The decorations, walls and ceilings turned out to be made of highly flammable materials. The consequences of this would become tragically apparent on the evening of November 28th in 1942. That particular day was a Saturday, which is almost always the busiest in nightclubs. It also happened to be the Thanksgiving weekend. At the time, people in the area had hopes that their college football team would be heading to the Sugar Bowl. However, Boston College was defeated earlier in the day. A celebration that had been planned at the Grove was cancelled. Even so, on that Saturday evening the place was packed with about one thousand people. Considering they were only licenced to hold less than 500, this was a serious safety violation. One of the people in attendance was Buck Jones, a popular western movie actor from the 1920s to his death. Some servicemen were also there with their wives or girlfriends. There also was a young couple who had just been married earlier in the day. The fire started some time after 10, and it engulfed the building so quickly that some victims were found later in their seats, having been overtaken by smoke and toxic gasses so quickly that they had no opportunity to react. In the panic to escape, some tried to use side doors, but they had been locked, making it impossible to get out. There was a revolving door at the front, but such doors are totally useless when trying to evacuate a building quickly. 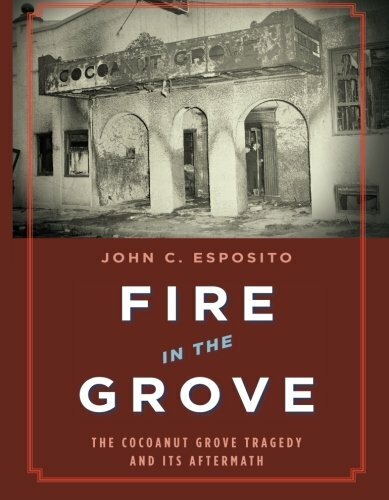 The Cocoanut Grove was a fire trap, and the tragedy was entirely avoidable. People had few means of escape, and when the fire broke out, it was filled to more than twice of the licenced capacity. The decor was very flammable, and highly toxic fumes quickly filled the air. Fire codes and laws were changed after the blaze, and establishments caught violating were heavily fined and even shut down. Exit signs had to be well lit and easily read, and emergency exits were required. These could never be locked or be otherwise inaccessible in the event that people needed a quick escape. Decor had to be fire resistant. The owner of the Cocoanut Grove, Barney Welansky, was eventually charged with manslaughter. He was accused of being well aware of the violations that were occuring, and did nothing about it. Welansky happened to be in the hospital the night of the blaze. He was put on trial, and convicted on 19 counts. Prosecutors selected that number of people at random to represent all of those who died that terrible night. A few years after his imprisonment, the governor of the state pardoned him. Welansky apparently had terminal cancer, and he died not long after his release. The pardon was very controversial, and the governor tried to keep it as quiet as possible, but reporters found out about it. The cause of the fire was never determined. In the aftermath, a bus boy was blamed for lighting a match so he could see, as he was trying to put in a light bulb. The fire began very shortly after. However, an inquiry cleared him of any wrong doing. He survived the fire, but was ostracized, as many people continued to believe he was responsible for it happening. The number of people who died as a result of the blaze was 492, with about 200 more seriously injured. One result of the tragedy was that new medical treatments were successfully used to help people with burns. Antibiotics were introduced to help heal infections, and other techniques were tried for the first time. Since they were found to be successful, they were soon used in other hospitals in the United States and around the world. Today, the Boston neighborhood where the Cocoanut Grove fire took place has a sidewalk plaque in memory of the victims. This book offers an extensive overview of the fire and aftermath. Available in hardcover, paperback and Kindle. Yes, that is true. The laws have helped save lives. I am a bit surprised that Welansky was convicted. He was probably not a saint but the nightclub was inspected before the incident with "no violations or potential hazards being found". So it wasn't really his fault (unless he faked some documents saying the decor was fireproof). The problem was it was wrong to say in the first place that there were no potential hazards found. The decorations were highly flammable, which is why the fire spread so fast. I agree though it wasn't all his fault, since the inspection was faulty to begin with. What a tragedy. I'd read about other nightclub fires, but not about this one. So sad. It sure was tragic, and totally avoidable too. Thanks for stopping by.